Our congratulations! You’ve done a great work. You won this event for the second time in a row. So please tell us the secret. Xu Jun, head coach: I think our key secret is that we have a very good team spirit, and our players have improved a lot during recent years. What conclusions did you draw after the Olympiad, where your team showed not the best result? Xu Jun: I think it’s a little bit difficult for me to answer these questions. But I think since our players are very young and they are also students in the universities so except for chess they have their own life. So I managed to catch everybody before this championship to get some training. Thanks to the Chinese Chess Association and all the leaders we have got our own very good training before this championship. Do you do trainings only before the championships or just during the year ? 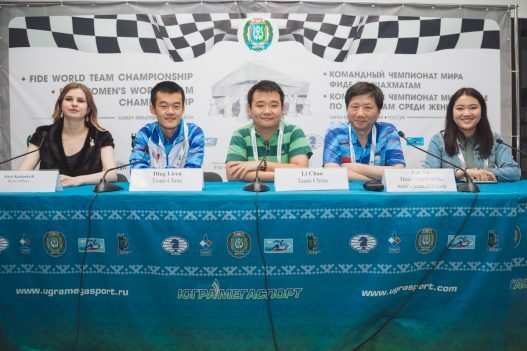 Xu Jun: Our players travel a lot abroad to international chess tournament and also the Chinese Chess Association organizes a tremendous fundament for them to get trained. Some time later the grandmaster Yu Yangyi had the chess match with Grischuk from Russia. So I think it’s a very good opportunity for our players to get some trainings through this match. How does your Government support you after your wins in such events? 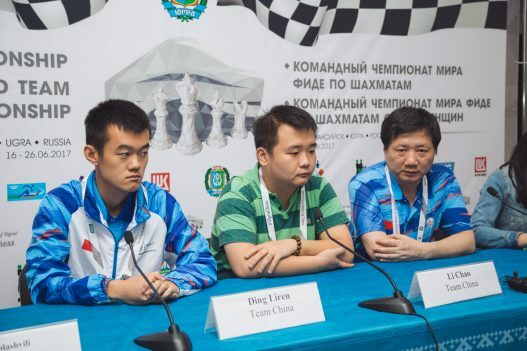 Xu Jun: Now we just founded the chess foundation sponsored by JINJI company. We will get some bonus from this foundation and also from our Government. Thank you. Questions to the players. Ding Liren, what your game do you consider to be best here? Ding Liren: Of course, my game against Ruslan Ponomariov. I managed to recover from bad games at the start, before a free day I didn’t perform well. I wanted to try something new, I didn’t want to repeat the same line. In general, I had very interesting opponents. During the game I thought my game wasn’t straightforward and I later checked it in the computer: my game was perfect. So I was very satisfied. Li Chao, what about you? 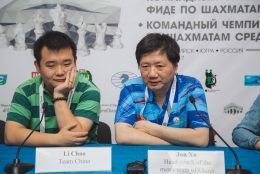 Li Chao: Of course my game of the last round and against Fedoseev. Also I wonder about your bracelet. What does it mean? Li Chao: It’s a blessing from the Buddha. In general, what do you think about the organization? Are you happy with it? 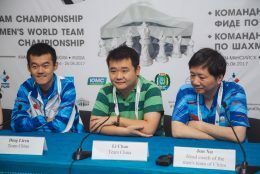 Li Chao: If we win, it’s perfect. It’s my feeling. Ding Liren: I liked everything. By the way, we played billiards after dinner every evening. Maybe, that’s the key secret of your team. Thank you and good luck!